Brief (Where we’re at): Samar is gone, spirited away by Red at her request after a contract on her life was taken out by Mossad with the relentless and amoral Osterman Umbrella Company (Blacklister #6), the go-to organization for spy agencies world-wide seeking to eliminate their own agents when they came to be deemed security risks. In Samar’s case, this was because she failed a polygraph test when she lied to cover up the fact that she had a deteriorating mental condition, vascular dementia, a result of her nearly drowning. In time, her condition could mean she might no longer be able to keep a secret. Aram insisted on making plans with Samar to accompany her into a new life set up for them by Cooper, but Samar knew this could never be, and reached out to Red instead. She knew she would have to leave Aram behind. Aram, however, cannot accept that Red was acting in good faith and cannot bear the loss of Samar. Inconsolable and furious, he slugged Red and declared he would never forgive him. Meanwhile, the matter remains that the Reddington Task Force is now under the purview of the DOJ’s Deputy Director Anna McMahon, who believes Red has become aware of a plot against the interests of the United States being perpetrated by herself and no less than President Robert Diaz, in complicity with a henchman, tracker and assassin, “Mr Sandquist.” Red has no direct knowledge of the details of the plot, but McMahon suspects he does. The three people who did know – the Director of German Intelligence Ava Ziegler, ex-MI6 Agent Christopher Miles, and contract killer Bastien Moreau (Blacklister #20) – have all been assassinated. The only proof of the plot is a document, a dossier compiled by ex-MI6 Agent Miles. It is contained on a flash drive which was ditched by Moreau along a sidewalk and randomly picked up by a young boy who brought it home in his backpack. Police Chief Walker: You need help? Walker: What is this? Hey. I’m talking to you. Walker: Who the hell are you? Olson: –you and a cadre of corrupt underlings. I’ve provided a sample of the kind of proof that my team has gathered. Copies, actually. It’s all quite well documented – the warnings of impending raids, the secure transport your men have provided, the cartel members you’ve neglected to arrest. Walker: What do you want? What is this? Olson: A notification. We’re not asking you to stop anything, we’ve simply decided to change your employer. Olson: I’ve been retained by the Tuerto Organization. You report to them now. The Saleris are done. You can arrest them or kill them, my client doesn’t care. Do as you’re told, and you’ll be hailed as a hero for ending the Saleri era. Ignore my instructions, and you’ll be destroyed. Publicly and permanently. Okay, then. Goodnight, Chief. Aram: Uh, yes. I’d like to close my account. The authorization codes? Of course yes, I’m ready. Access Delta 6-3-9. Echo-Uniform-Whiskey. That’s right. Liquidate everything. All $60 million. Dembe: [ EXHALES SHARPLY ] Raymond. It’s Elizabeth. Red: Just hold on one sec. Liz: [ SIGHS ] Why is it that men think the only way to handle a problem is to be stoic? Red: Because Gary Cooper or Henry Fonda or Gregory Peck have taught us that’s how a man should deal with a problem. Liz: Aram is completely shut down. Red: I have a competitor I want you to take out of the competition. Red: Only time will mend Aram’s broken heart. Or revenge. Liz: You want us to take down an honest cop? Red: The chief is not my competition. Nor is he honest. He used to work for one cartel. Now he works for a more powerful one. My competition is the woman who convinced him to switch sides. Liz: She helps one criminal organization take over another? Red: She helps them expand. By identifying targets. Organizations vulnerable to hostile takeovers – businesses or individuals whose debt can be leveraged, or, in this case, a cop who’s susceptible to persuasion. Liz: Are you siccing us on a criminal or a corporate raider? Red: [ CHUCKLES ] Corporate CEOs are slavishly beholden to quarterly earnings, often sacrificing long-term strategy for short-term gain. Well, CEOs of criminal enterprises may not have Wall Street analysts to answer to, but they’re still under the gun to increase profits because if they don’t, they’re not given a golden parachute and exiled to a mansion in the Hamptons, they’re killed. So pointing them to greener pastures is a very lucrative business and no one is better at it than Olivia Olson. Liz: Why are you telling me all this? You’re usually annoyingly guarded about your true motive for giving us a case. Why are you admitting that you’re giving us this criminal to expand? Red: Because it’s a win-win. I get to expand my reach, and you get to know more about what Anna McMahon has been up to. Liz: Are you telling me Olson has intel on Anna McMahon? Red: As I said, it’s a win-win. Cooper: Reddington wants the Task Force to go after a Blacklister who works with Anna McMahon when Anna McMahon is overseeing the Task Force. Liz: I know. It’s tricky. Ressler: The tricky part is knowing if we’re getting played. Figuring out if this Olson woman is involved in McMahon’s plot against this country or whether Reddington just said that so we’d have incentive to take out his competition. Liz: It’s incentive enough for me. We are nowhere on figuring out what McMahon is doing. She’s a top-level justice department official who has the ear of the President and is orchestrating a conspiracy so dangerous she had to hire a hit man to kill the people who found out. And she wanted Reddington executed. And despite all that, somehow she’s now our boss. Cooper: Which is why we have to proceed with caution. Tell us about Olson. What do we know? Liz: Well, for starters, her name isn’t Olson. No one knows her real identity, only that she’s a former Wall Street analyst who made a fortune doing quantitative risk analysis for private equity firms. Ressler: She facilitated hostile takeovers. Olivia Olson: What exactly is the problem? Paul Halperin: Eikendoll. She’s a competitor, and her new construction company is cutting into the Regal bottom line. Olson: So you either want to remove her or destroy her. Halperin: I want to do both. Liz: Her approach to the Collington police department is typical. She identifies vulnerable businesses and then target maps them until she knows every pressure point, which she then exerts to strip them of their assets or absorb them. Cooper: Or, in this case, to sell out one cartel and pledge allegiance to another. Ressler: Who happened to be her client. Liz: Reddington says her clients range from a real estate developer in Boston, to a crime lord in Mumbai, to Ukrainian oligarchs. She commands a seven- or even eight-figure fee to help them expand into both criminal and legitimate businesses. Aram: So she hurts innocent people. Just like Mr. Reddington. What? You know it’s true. Cooper: So, Olson. What’s our way in? Liz: Reddington says she has a meeting with a prospective client. He gave me a time and place. Cooper: Get a tactical unit, put together a plan to interrupt that meeting, and bring her in. Ressler: By taking her out, we’re helping Reddington extend his reach. Are you okay with us doing that? Cooper: If it gets us closer on Anna McMahon, yes, I am. And the only way it’ll get us closer is if we keep her from knowing what we’re up to. So no mention of her name to anyone. I don’t want McMahon to know we’re aware there’s any connection between her and Olson. Understood? Good – roll out. Agent Mojtabai? A word. Cooper: The job requires a clear head and complete focus. I know that’s a lot to ask at the moment, but it’s the bare minimum. If you can’t give it, you need to let me know. Aram: I am focused, sir. I’m angry. But I’m focused. In ways I never thought possible. Ressler: Win-win? No. I didn’t sign up for a win-win. I signed up for win. Us winning. Not him. Liz: –The only difference is that we actually know what it is this time. Ressler: And that doesn’t bother you? That he didn’t even have to pretend anymore? That he’s open about using us to make him rich? Look, I know you hoped that I’d be okay with us not pursuing who he really is, but I’m not. Ressler: This must be the client. Liz: Aram, we have a visual. Is everybody in place? [ To Ressler ] We’re not done talking about this. Aram: TAC unit’s in place. They’re feeding us audio. Searching for CCTV feeds of the area now. Liz: Reddington’s the new client? Ressler: So much for him telling us what his angle is. Cooper: I don’t care if it blows the op, I want eyes inside that building. Aram: Still working on video. Cooper: Keen, Ressler what are you seeing? Liz: No more than you. Reddington’s inside. Ressler: You hearing this? That’s her. Red: I’ve never made a virtual acquaintance. I must say, it feels – pornographic. Olson: Well, an abundance of caution is an occupational hazard. Aram: Which means she’s broadcasting to this location. Liz: Can you trace it? Ressler: Yeah, well, try fast. Before Reddington double-crosses us again. Olson: How might I be of assistance? Red: You convince people to change allegiances. I’m hoping to convince you to do the same. I’ll make it worth your while. Olson: I doubt that’s possible. Red: Well, I guess we’ll see. Olson: Who would you expect me to betray? Liz: What is he doing? Ressler: Exactly what you wanted us to avoid. Cooper: He better have a good explanation for why, or there’s gonna be hell to pay. Aram: Okay, I’m not seeing anything matching this kind of video feed on any of the local towers. Liz: Where else could it be coming from? Aram: Maybe. Maybe, but for a direct feed to be reliable, you’d have to be close. Aram: Uh, within 5 or 10 blocks of the receiver. Cooper: So she’s nearby. How do we narrow that down? Olson: I don’t know how many times I need to say this for you to be convinced, but I have no ties to Anna McMahon. Red: The NAFTA renegotiation. When the treaty went for Senate confirmation, the White House was one vote shy. Anna McMahon asked you to get it for them, and you did. Aram: Okay, okay, okay, she is transmitting a lot of data, so she’d have to use a high frequency. Cooper: A police radio. Go to scan mode. Sweep the 900 megahertz spectrum. Olson: You overestimate my reach. Red: And you underestimate mine. You’re not the only one capable of drawing a heat map. Aram: Okay, all right, all right. I got it. 982.5. Whoa. Wait. That’s weird. Aram: I can see the signal strength, but it’s not constant. Ressler: Is there some kind of interference? Aram: Uh, maybe, or she’s not stationary. I think maybe the signal’s being broadcast from a moving vehicle. Olson: You reached out as a potential client. But I get the distinct feeling you’re more of a potential competitor. Red: More of a successor, really. You’ve had a nice, long run. I’d hope to honor that by informing you of my hostile takeover in person. But perhaps this is best. Face to face, those conversations can linger uncomfortably. This way, we can simply disconnect. Liz: We’re headed north on Culver. Aram: All right, the signal’s getting stronger. No, hang on you overshot it. Uh, make a right. Liz: Okay, what exactly are we looking for? Aram: A van maybe? A small truck? Something with a visible antenna. Liz: That’s it. We’ve got her. Mr Coleman: [ Driving Olivia Olson’s van ] Ma’am. We’ve got a tail. They’re tracking the feed. Aram: All right, she must have disconnected. I lost the signal. Olson: [ On phone ] You have a very powerful enemy. Anna McMahon: Why? What’s wrong? McMahon: What are you talking about? Olson: He asked me to betray you. And when I said I wouldn’t, I was chased by the police. McMahon: I can make it go away. Olson: [ SCOFFS ] You better. Or I may be forced to oblige Reddington. You may consider it a badge of honor to have him as an enemy. I don’t. Red: It will get better. Aram: I know. You’re gonna make sure of it. Cooper: You have a lot of explaining to do. Red: Why is that? I led you by the hand to an elusive Blacklister, [ CHUCKLES ] and you let her get away. Cooper: You hid the fact that you were the one meeting with Olson. Red: I omitted it. Hiding implies I cared one way or another about you knowing. I didn’t. Cooper: You told her about Anna McMahon. How could you do that? By now, she’s told McMahon we’re onto her. Red: I certainly hope so. Cooper: That’s the last thing we wanted! Red: Harold, sit. Take a breath. Smoke a cigar. Read some “Calvin and Hobbes.” Whatever you do to relax, do it before you have an aneurysm. Cooper: Please tell me why you think it’s a good thing that the person we’re suspicious of now knows we’re suspicious of her. Red: Anna McMahon is smart and cautious, and, try as we might, neither you nor I have been able to get the merest whiff of her plot against this country. I thought it best to force the issue. Let her know we’re looking, put her on alert, make her think twice, and in doing that, possibly, hopefully, cause her to make a mistake. McMahon: Exactly what part of “I run this Task Force” do you not understand? Red: Sometimes my grasp of human nature astonishes even me. Cooper: Let me say it back to you, see if I understand what you want – a justification memo once Reddington gives us a case but before we start working on it, a real-time memo where we take time out from what we’re working on to tell you what we’re working on [ Dembe’s CELLPHONE VIBRATES ] and a case file memo where we detail what’s in the case file, attached to the case file memo. McMahon: It’s all about flow of information. Cooper: Tell me, with all this information you want us to flow, when are we supposed to actually work? Dembe: [ HUSHED ] It’s urgent. McMahon: Everything you do is based on the instruction of a sociopath. So forgive me if I want input into whether or not we do as he says. Red: You don’t know her? Red: She facilitates mergers and acquisitions for criminal clients across four continents. Cooper: She’s the latest Blacklister. If we capture her, we capture her files. A treasure trove of information about her clients and the companies she’s blackmailing on her clients’ behalf. Do you have a problem with that? McMahon: Of course not. Just like I’m sure you’ll have no problem sharing the captured files. If they do contain the names of her clients, I’ll want to assign agents to coordinate their arrest. Cooper: I’ll alert you once we have them. McMahon: Sounds like we agree. Excellent. Glad we had this talk. Director Cooper. Cooper: That accomplished nothing. Except to bury me in paperwork. Red: Patience, Harold. We’re chumming the waters. Sooner or later, the big one will bite. Ressler: Talk about dejá vu all over again. 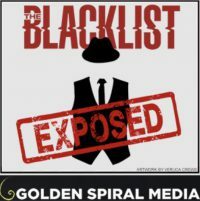 Reddington misleads us, Cooper slaps his wrist, and life goes on. Liz: Because he gives us high value criminals and it makes the world a safer place. Ressler: Yeah, a fact I’d come to terms with before finding out that he was an imposter. Liz: I know this is hard for you, but whoever he is, he’s looked over me since I was a child. So if I can accept that his real identity is none of my business, I need you to accept that it’s none of yours either. Ressler: And if your mother’s out there and she knows the truth? Liz. Katarina Rostova framed my father for crimes he didn’t commit. Because of her lies, I grew up believing he was a traitor. If she is alive – and that’s a big if – she probably wouldn’t tell me the truth anyway – even if she knew it. Look, I really think the best thing is to just let it go. Aram: Okay, so I was able to pull an image from a traffic cam at Culver and Talbot. Aram: Not on the driver, but the trucks that cut you off were registered to Hammerstone Electric, which, uh, tells us nothing since I doubt you were attacked by a horde of angry electricians. Aram: Right. One month ago, a private equity firm in New York bought up Hammerstone’s debt and shut them down. Ressler: So we were attacked by a horde of angry MBAs? Aram: And they were bought by Raincloud LBO, a New York firm specializing in hostile takeovers. Ressler: Well, it makes sense that she would have a company to front her transactions. I’m going to get a warrant. Liz: [ To Aram ] Tonight – You, me, and as many pitchers as it takes to thoroughly drown sorrows. Deal? Aram: Well, I don’t normally drink, but under the circumstances – sure. Mitchell Young (Managing Partner of Raincloud LBO): We’ve been over this I don’t know how many times – their leadership structure, their greenmail plan, the staggered board – they’re not vulnerable to activist investors. Olson: [ On video ] And her personal life? Matt Wall (Board member): Clean. Squeaky. Church on Sunday. Olson: I did have one other idea. Eikendoll just completed a new sky deck at the Alta Hotel. What if there was an incident? Matt Wall: You wanna target public opinion. Olson: –If corners were cut during construction, fumes would get trapped in that chase, all it would take is a pilot light from a furnace, an errant elevator spark any sort of combustion would blow the living hell out of that mechanical chase and comprise the bridging. Without proper support, the stress would cause the channels to twist and fall like dominoes. Young: You wanna collapse the deck. Make it appear Eikendoll cut corners and crater public opinion. Force her to sell. Matt Wall: Guys, these are peoples’ lives we’re talking about. Is this contract really worth that? Olson: I hope that was a rhetorical question. Ressler: Ladies and gentlemen, FBI. Liz: FBI. We have a warrant to search this building. Ressler: Stop what you’re doing. Step away from your computer. – Line up against the glass partitions. Ressler: Agent Ressler. I’m gonna need a word with your Managing Partner. – Hands where we can see them. Eric: [ On phone ] We got a situation out here. Eric: They say they got a warrant. Young: What do you want to do? Olson: We’re burned. Handle it. Young: Agent Ressler? Mitchell Young. I’m Raincloud’s Managing Partner. What’s going on? Ressler: Read the warrant. We have a court order to search. Ressler: Yesterday, vehicles registered to Hammerstone Electric were used to thwart an FBI pursuit. Your firm owns those vehicles. Young: We acquired Hammerstone a few months ago, but we bought the company to sell its assets. If somebody stole trucks, that’s not our fault. Liz: You. What is it? Liz: What are you trying to tell your friend? Liz: –including obstruction, securities fraud, aiding and abetting. So how about you help us out and tell us what you know? Eric: Two floors up. Heilman & Main, CPA firm. It’s not a CPA firm. Liz: Take it offline now. I said take it offline! Matt Wall: I can’t. It’s a malware program originating from the host system. Red: You’ve made a terrible mistake, Aram. Aram: You took something precious from me. Red: A mistake you’ll have to rectify. Aram: So I took something precious from you. Red: I want my money. Aram: When we were in Luxembourg, Dembe opened an account under your name at Banque Vertrauen. I kept a copy of the account-access fob we stole that day. It took you long enough to figure out what I did. Honestly, if you hadn’t walked in just now, I was thinking I was gonna have to tell you myself. Red: Is this your idea of vengeance? Aram: Not vengeance. Leverage. $60 million worth to get you to take me to Samar. Red: No matter what happens next, this doesn’t end the way you think it’s going to. Aram: My bag’s packed, my goodbye notes written. I’m ready to face the consequences either way. Are you? Ressler: I want her name and location. Mitchell Young: I don’t know her location. Nobody does. She doesn’t take meetings in person. She’s never been here. Ressler: Her name then. All right, what was on those computers? Young: There’s no point. You’re too late to stop the attack. Ressler: Attack? What attack? Who’s she planning to attack? Young: No one here is gonna help you. Liz: Cyber’s en route, but those drives are fried. Someone with a lot of skill’s gonna have to put those pieces together. Ressler: [ To Young ] All right, listen to me. There’s an attack in motion, if people get hurt, you’re gonna be charged as a co-conspirator. You want that? Young: What I want is a lawyer. Liz: We got a problem. We have reason to believe Olson’s planning an attack – probably to leverage her next takeover victim. Liz: That’s the problem. We don’t know who, where, or when. All we have are pieces of encrypted files from her servers. Cyber just showed up. We’ll send over whatever they decrypt. Red: Have you reached out to Aram? Liz: I tried him. He didn’t pick up. Red: That was Elizabeth. She doesn’t know you’re gone. You didn’t say goodbye. Aram: I told you. I left her a note. Red: [ Drinks ] Mm. Ahh. [ INHALES SHARPLY ] It’s hard to leave people you care about. Or maybe you didn’t say goodbye because you don’t think that’s what this is. And if that’s the case, let me be clear – If you become part of Samar’s new life, Harold, Donald, Elizabeth – you’ll never be able to see them again. Never speak to them. Never be there for them when they need you. Aram: Is that why Liz called – because they need help? Red: You running away will not take Samar off the Mossad’s kill list. They’re counting on you to lead them to her – which is why they bugged your apartment, phones, friends. Aram: How do you know that? Red: Because that’s what I would do. It’s why Dembe took an extra hour to get us to the jet – shake off any possible tail. From now on, Aram, you call a friend or family, text, e-mail, insta-whatever, anything – they will trace it to you, find Samar, – and kill her. And yes. The Task Force needs help. To stop an imminent attack. Red: Doesn’t matter. You’re out. Sit back, relax – calculate the hourly interest you’re accruing on my $60 million. Woman: Mr. and Mrs. Eikendoll, I’m sorry to interrupt – I’d like to introduce you to Michale Muhlbach. Michale’s the President of the Pratt-Wickler Foundation. Caroline Eikendoll: Mr. Muhlbach, it is so lovely to meet you. Muhlbach: I just wanted to say thank you for pulling the strings to get us into this space. Just stunning. Roger Eikendoll: Actually, my wife Caroline is the CEO and brains of Eikendoll. I’m just the arm candy. Caroline Eikendoll: Don’t be. The work Pratt-Wickler has done for Parkinson’s research is so admirable and so critical to so many people. We’re just happy to be part of the solution. Muhlbach: Thank you again. [ CHUCKLES ] It’s gonna be a fantastic evening. Roger: Yes. Let’s raise some money. Dembe: The data from Elizabeth. Red: [ GRUNTS ] Mm. Aram: What is it code? Data? Is it encrypted? Red: You’re either in or you’re out. Aram: [ Pause ] They can’t trace me to Samar until I’m with her. And I am not with her yet. This isn’t heaven or hell. It’s purgatory. And I can help from purgatory. So, please. Aram: $273. That’s the interest per hour on $60 million. $2.4 million a year, $6,575 a day, $273 an hour. Aram: I was being generous. The federal funds rate is 2.5. Red: Yes. [ GRUNTS ] And mine is 25. Red: Which makes the hourly interest [ Squints ] $1,700 – and $12. Aram: And if I solve the riddle? Red: I’ll round it down to $1,700 – Friends and family discount. Liz: Anything on the attack? Ressler: Nothing. Tell me you got something off these drives. Liz: Nothing concrete, strings of data. A few partial names. Some routing numbers to a bank in London. Liz: Yeah, but we don’t know to what. It appears to be some sort of event space, but it could be anywhere. Ressler: Well, her employees downstairs either don’t know or won’t talk. Liz: Tell me you know something. Aram: I do. Um- Uh, that is- Uh, hi. Aram: Uh, Mr. Reddington showed me what you sent to him. Liz: Uh, where are you? Aram: Honestly? Uh – I have no idea. Red: [ Loudly ] The target you’re trying to identify, we believe it may be in Manhattan. Liz: Manhattan? What makes you think that? I-I’m putting you on speaker. Aram: Okay, so a few of the broken code strands look like they may have been trying to overcome a firewall on CCTV cameras in Midtown, specifically 50th south to 38th. Ressler: We have blueprints but just pieces. Aram: Yes. Some of which were date-stamped as recently as last fall, so you’re looking for new construction. Ressler: Go back, Keen. There, that tower. Ressler: It’s the Alta Hotel in Midtown. Liz: Aram, you’re the best. Tonight the pitchers are on me. Aram: Um, actually, Liz– [ BEEPING ] Agent Keen? Red: [ Looks at his watch ] Another hour in purgatory. Caroline Eikendoll: Thank you, thank you, thank you, thank you. Thank you. When I first started Eikendoll Construction, people told me it couldn’t be done. That the contracting business was a boys’ club, and that I would be devoured. [ LIGHT LAUGHTER ] But the business is thriving, and this beautiful property is proof of that. I proved them wrong. But when my brother, Todd, was diagnosed with Parkinson’s eight years ago, I was forced to re-evaluate things. I still care about the bottom line – only now the bottom line I care about is finding a cure for Parkinson’s. And once again, the doubters are saying it can’t be done. Which is why are here tonight. To prove them wrong again. [ APPLAUSE ] So- So open your hearts and open your wallets, and however many zeroes you were planning on putting on that check, add two more [ Laughter ], because that’s how much finding a cure matters. Thank you so much. Caroline Eikendoll: Thank you so much for being here. Cobb: This is security, Cobb speaking. Liz: Mr. Cobb, Elizabeth Keen, FBI. We have a credible threat that your building is the target of an attack. Liz: You need to evacuate immediately. Do you understand? NYPD is en route, we need everyone out. Security Officer: Miss Segers? We’ve got a situation. We need to clear the space now. Everyone out. Cobb: Our security office is ahead. Down the hall and to the right. Do we know what kind of threat we’re looking at? Liz: We’re not sure yet. Ressler: Sound the fire alarms and run your evac plan. Ressler: I’m going up top. Ressler: I got a 10-72! I need fire and paramedics on site! Caroline Eikendoll: Roger? Where’s Roger? Where is my husband? Where is Roger?! Ressler: Hey! You know where the blast came from? Security Officer: Don’t know. Below us, I think. I’m trying to get answers now. Ressler: We need everyone out. Ressler: Get out! Move! Get out! Ressler: I’m gonna get you out of there. Just hang on, all right? Caroline Eickendoll: I can’t hold on. Ressler: Give me your hand. Caroline Eickendoll: I can’t- I can’t let go! Ressler: Come on. You can do this. Look at me. You can do this. Just give me your hand. Come on. Release that and give me your hand. Come on. Do it now. Come on! Olson: [ On phone ] I just got word the Feds have Mitch Young in custody. We need to call it off. Coleman: Call it off? It’s already done. Coleman: Which means it won’t be long before they connect this back to you if they haven’t already. You need to get out of town now. Olson: I can’t. The servers. Coleman: I’ll handle the servers. Just get out before it’s too late. Ressler: NYPD’s still trying to account for everyone, but M.E. says we lost six. Ressler: She’s gone. Must have knew we were coming. Liz: Yeah, well, this’ll come in handy. Dembe: Edward says we’re landing in 20 minutes. Aram: So. Where are we? Red: Why don’t we just wait and see? Aram: You know, I do understand why Samar didn’t say goodbye. And I can accept why you helped her avoid that. But I couldn’t accept that we weren’t gonna be together. Red: Samar accepted it. She engineered it. Aram: She’s wrong. She thought I’d resent caring for her as her condition worsens. I won’t. Red: I’ve made many difficult choices in my life. Choices that at one point or another have brought pain and sorrow to everyone I cared about. That’s a heavy burden to bear, even if the path one chooses is the only one in sight. It’s the burden Samar now bears. She didn’t leave because she thought you would come to resent her. She left because she saw no other path. She’s a target. And if she was in your life, you’d be a target, too. So she left. Allow her to believe she did the right thing. If you go to her, she’ll just have to leave you again. Don’t make her burden heavier than she can bear. Aram: Samar is the strongest person I know. Red: And yet she didn’t have the strength to say goodbye to you. You are more powerful than you know, Aram. Use it wisely. Anna McMahon: I understand you lost Olson. Cooper: To summarize the case file memo Agent Ressler’s working on that will summarize the case file Agent Keen is preparing – yes, we did. Cooper: We recovered Olson’s hard drive. Our cyber unit is in the process of transferring the data over to members of your staff. If there are any actionable cases, you’ll be able to refer them to the proper authorities. McMahon: Excellent. Perhaps our inter-agency cooperation won’t be as difficult as I imagined. Cooper: It shouldn’t be. We all want the same thing. McMahon: You and I do. But I doubt Reddington does. For example, with Olson, did he tell you why he put her on the Blacklist? Cooper: Your guess is as good as mine. McMahon: Well, I guess I’ll go look at the files. And like I said we’re off to a promising start. Cooper: Yes, I think so, too. Liz: I thought you said you were going to be with Samar. Aram: I was. I mean, uh, well, that’s where Mr. Reddington was gonna take me when- when you called. Liz: And did you see her? Aram: No. And I’m not going to. I went because I love her. And I came back because I realized the best way to love her is to honor her wishes. Liz: That couldn’t have been an easy decision to make. Aram: It was not. Or a cheap one. I owe Mr. Reddington $56,100. Aram: I will explain over drinks. If you’re still up for going out. And- And paying. Liz: You bet. Uh, just let me finish this case report. Aram: Take your time. I got to run home and talk to someone first. Ressler: Donald Ressler. Oh, hey, MJ, thanks for returning my call. Uh- Listen, [ SIGHS ] I understand that you, uh, ran point for the Agency back when Langley was hunting Katarina Rostova. I was wondering if I could pick your brain about what you found. Cooper: McMahon took the files. Reviewed them herself, then kicked the ones with actionable intel back to her staff to pursue. All but one. Red: Any chance she knew you’d made copies before giving her the hard drive? Cooper: None. She assumed she had them all to herself. So the one she kept back is the one she didn’t want anyone to see. Cooper: Mean anything to you? Red: Yes. It’s a reference to the French Revolution. It means “everyone else.” The 99%. It also means McMahon used Olson to pressure the Third Estate into helping McMahon carry out her plot against the United States. You have your first lead, Harold. Congratulations, and you’re welcome. Aram: Can you hear me? I know you’re listening. Aram: – but I won’t. Aram: Do you hear me? Aram: She’s gone. She’s really gone. Trivia: Wikipedia: The estates of the realm, or three estates, were the broad orders of social hierarchy used in Christendom (Christian Europe) from the medieval period to early modern Europe. Different systems for dividing society members into estates developed and evolved over time. The photo collection from this episode is available in two Twitter “Moments”. You do not need a Twitter account. Just follow the links.